The 2017 Vista Fire burned approximately 86 acres near Casitas Springs and left hillsides adjacent to Highway 33 barren. Post fire conditions like the ones observed in this area are well known for their ability to produce rock and debris flows that are likely to impact homes and roadways. Potential for flooding and debris within Division due to over-topping of the Fresno Canyon Debris Basin or channel east of Highway 33 during or following high intensity rainfall. Potential for restricted or blocked access to Division from Highway 33, Sycamore Drive & Edison Drive during or shortly following rain events. Threat of falling or flowing mud and rock into homes during or following rainfall especially with rainfall rates that exceed .25”/hr. Rainfall rates of .75”/hr. or more may cause significant flooding and debris flows capable of causing residence structural damage and serious injury or death to inhabitants or persons in flow path. Potential for restricted or blocked access on Highway 33 during or shortly following rain events. Threat of rock falling from slopes into homes or property. Threat of falling mud and rock into homes during rainfall especially with rainfall rates that exceed .50”/hr. Before, during and after a rain event, representatives from the Ventura County Sheriff Office of Emergency Services with the assistance of numerous other agencies and experts will be monitoring weather forecasts and observed conditions for potential impact to the area. In the event a forecast is issued that may result in adverse conditions for Divisions A, B or Z, detailed information will be sent out to residents utilizing the VC Alert Emergency Notification System. Residents are highly encouraged to register for this system by visiting vcalert.org. It is also recommended that residents remain vigilant and maintain constant situational awareness on changing conditions. Changes in the stability of the debris may occur rapidly and without notice therefore heightened awareness must be exercised. During a closure of Highway 33 between Casitas Vista Rd and Nye Road, Santa Ana Road will serve as the alternate route to bypass the closure area. Due to its location, this area is also prone to flooding and may not be available. 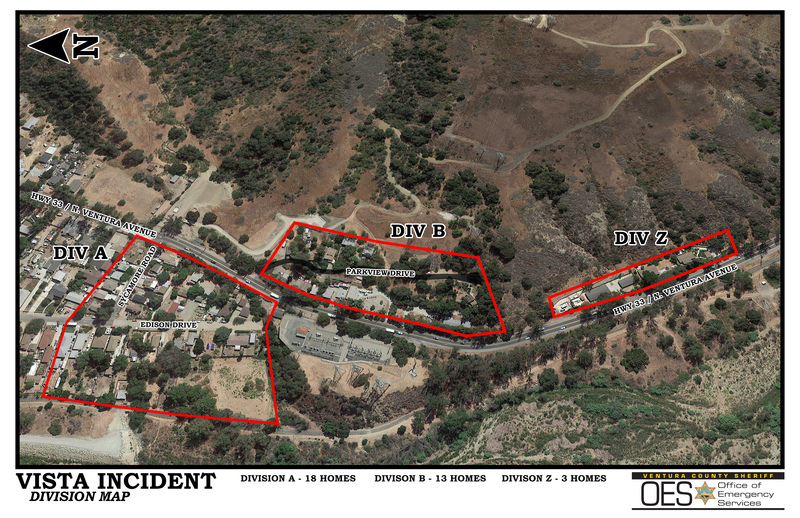 In this case, motorists will likely need to take Highway 150 from the City of Santa Paula into Ojai.